(Burr)ied in the Maine woods. 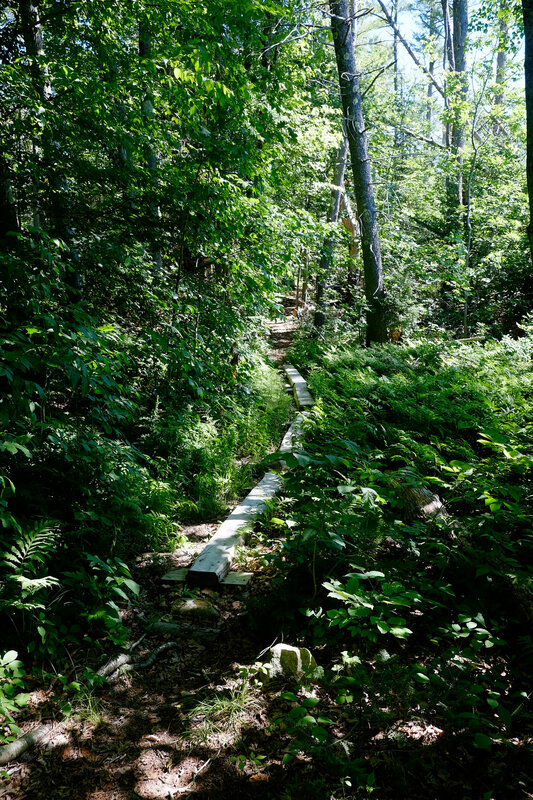 At the end of a week's camping and visiting in Maine my husband and I stayed a night at Bradbury Mountain State Park, a stone's throw from Burr Cemetery in Freeport, Maine that has a green burial section that's pretty and peaceful, if not remarkable. Maine is a state of rocky and sandy coasts, cold ocean, charming towns and small cities for tourists and residents, and vast wooded spaces. Burr Cemetery is at the edge of a microcosm of those forests. It is one of currently three grounds in the state that offer green burial. 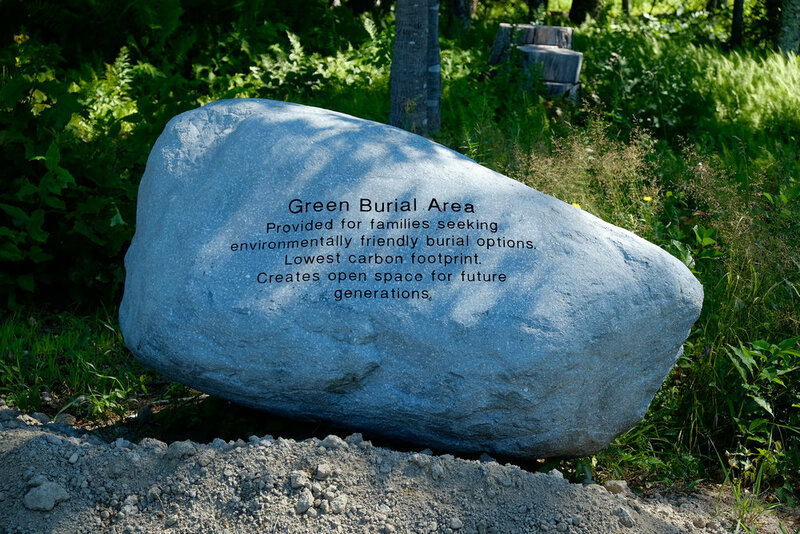 With 2 acres of green burial sites set aside in a 6.5 acre conventional cemetery Burr is considered a hybrid burial ground. It has a core of historic marble headstones dating from the 1800s, along a winding country road not far from Route 1 and minutes from downtown Freeport, best known for LL Bean and outlet stores but also not far from the islands and harbors of Casco Bay. 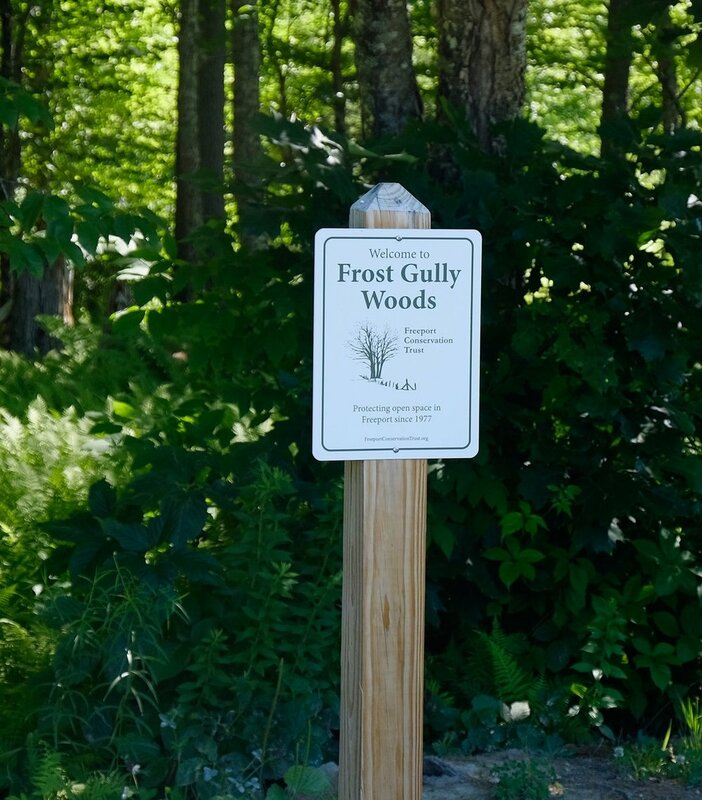 The green burial area is marked as many areas are by a native boulder, at the head of a trail leading into the graves and also into Frost Gully Woods, a small parcel owned by Freeport Conservation Trust that's open to the public but otherwise landlocked. By now I've visited a number of such cemeteries and didn't expect to find much new, but Burr is in The Natural Burial Cemetery Guide and I feel a special affinity for grounds I get to visit personally. At this time of year the woods are wet enough to host colorful mushrooms and the trees have reached their peak of summer greenness undifferentiated by spring or fall colors. From the sunny grass of the conventional cemetery the woods promise shade, which even in this northern state is welcome on a hot day. The trail leading to Frost Gully has the virtue of expanding the feeling of being in the woods and adds a vista into something just beyond reach. Chris Stilkey is current president of DC Stilkey & Son, a family-owned cemetery management business. 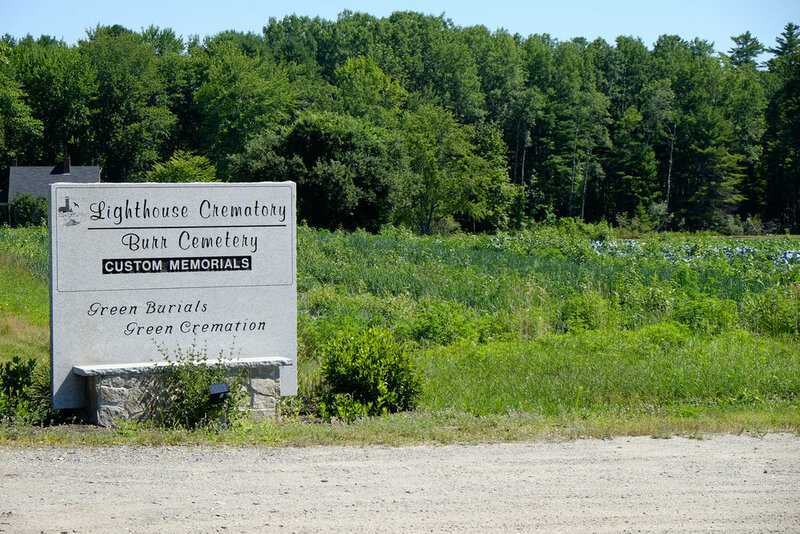 A decade ago the company opened Lighthouse Crematory and Remembrance, Inc connected to the office building at the back of Burr to offer "green" cremation using an efficient crematory and purchasing renewable Maine green energy to offset the CO2 produced. The green burial section is another venture to be accountable both to the environment and to customer's wishes to be sensitive to it. For me, the visit stood out because I realized for all the criticism of hybrid cemeteries as enterprises that only partially meet the goals of "natural," a small conventional cemetery like Burr is a pretty stable platform on which to build. A significant number of natural cemeteries exist as the brainchild of one person, and it's hard not to wonder about the security of their future. How dependent they are on the vision of the founder. Each time I visit a green burial cemetery I see a manifestation of a movement that didn't even exist in this country before the mid-1990s. We can wax nostalgic about how America used to bury its dead, unembalmed and in simple caskets, but it's the modern trend that gives us options. Modern green burial is a deliberate choice; to be closer to the earth and to our loved ones at death, to think about the consequences of what is done with our bodies after we die. A place like Burr, small as it is, confirms that others out there are dedicated to the vision as well. Newer PostDeath and cakes in Nyack.